For everyone who visits Saket for their shopping, the malls around have literally everything. It’s a great place to go hang out, but, if you’re in a rush, knowing exactly where everything is helps. Which is why we made you a guide to the three different malls in Saket so that you know what is where and can make the best use of your time eating and shopping there. 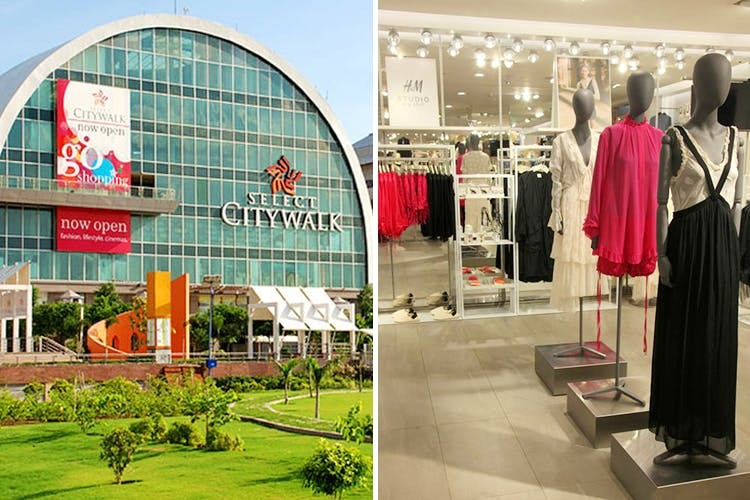 Citywalk has all our go-to stores, from highstreet to luxury. Get your dose of fashion with H&M, Zara, Mango, Aeropostle, Happily Unmarried, Forever New, La Senza, Adidas, Kate Spade, Muji, Aldo, Charles & Keith, Satya Paul, Da Milano, Massimo Dutti, Lacoste, Swarovski, amongst others. You can load up on make-up and beauty products from M·A·C, Bobbi Brown, Forest Essentials, Sephora, Jo Malone, Chambor, Colorbar, Inglot, Innisfree, The Body Shop, Clinique, Chanel, Estée Lauder, and others. You have a variety of restaurants, cafes and dessert parlours to pick from,and you could easily eat all three meals here. Take your pick from Burma Burma, Yum Yum Cha, Johnny Rockets, Mamagoto, Sushiya, Fat Lulu’s, The Salad Story, Farmacy, IHOP, Punjab Grill, Chicago Pizza, Twisted Tacos, Pa Pa Ya, Starbucks, San-Cha Yea Boutique, Cha Cha Cha, The Belgian Waffle Co., The Coffee Bean And Tea Leaf, Theobroma and more. DLF Place has a bunch of stores we’ve all been to at some point, Forever 21, Marks & Spencer, Accessorize, Clarks, Vero Moda, Om Book Store, Parcos, M·A·C, Foodhall, Hush Puppies, Mothercare, Skull Candy, Levi’s, Kazo and more. You can always go to the PVR to catch a movie here. We’ve all headed straight to Big Chill for a hearty meal after a crazy day of shopping. However, this mall has a bunch of other places you can eat your heart out at, like Chili’s, Cinnabon, Auntie Anne’s, Smoke House Deli, The Beer Cafe, Hard Rock Cafe, Dhaba By Claridges, Sagar Ratna, Karim’s and more. This mall has a variety of stores to shop at, even though people tend to visit the other two for shopping more often. You can visit Shopper’s Stop, Woodland, Tommy Hilfiger, Revlon, Levi’s, L’Oreal, Elizabeth Arden and Baggit, amongst others. We’ll admit the other two malls have better and more food options. If you find yourself here, you can go to The Great Kebab Factory, Bercos, The Tea Place By Manjushree, The Bottleyard and Cafe Coffee Day to grab a bite.